Valentino at Paris Fashion Week Fall 2013. With excellence as a core value, we bet Valentino will dazzle at this Paris Fashion Week fall/winter 2013 edition. Till then, browse through some of the brand's hottest past looks. The thought of Valentino at Paris Fashion Week 2013 makes us extremely anxious to see the new options from the brand. The luxury Italian label has earned its reputations through exquisite creations at each Paris Fashion Week edition, conditioning everyone to expect only the best from the brand. The sheer number of amazing Valentino designs is worth analyzing is definitely impressive, however we'll use some fairly recent examples that caught our attention from the brand. With a myriad of worthwhile looks to choose from, selecting the best is definitely not easy. Still, we cannot forget the romantic spring 2012 couture collection. Those who appreciate Valentino's interesting aesthetic approach and crave a bit of drama in their looks could easily fall in love with the entire fall/winter 2012 line. This year proved no less inspirational. Playing with elegant motifs and a fun perspective, the label brought a large array of fab looks in the resort 2013 collection. A sublime spring 2013 collection followed and, keeping the best for last, Valentino dazzled with its beautiful spring 2013 couture collection. With such inspirational looks in mind it becomes fairly easy to understand why this Paris Fashion Week fall 2013 edition is so eagerly awaited. 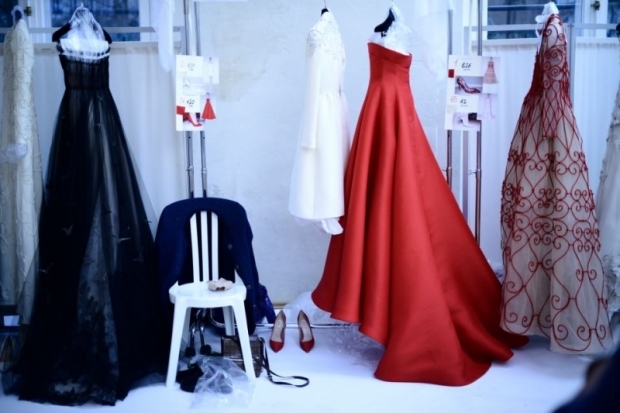 Valentino at Paris Fashion Week 2013 will be unveiled on Tuesday March 5 starting with 2:30 pm at Espace Ephemere Tuileries, jardin des Tuileries, Paris 1 er. Did we mention how eager we are to see the Valentino fall 2013 collection? We're willing to bet the new designs will be as breathtaking as the previous ones if not more. With excitement levels at an all time high, it can be definitely a hard to find a substitute to keep us inspired, however, we'd argue that browsing through Valentino's hottest creations up to the present moment can be an extremely pleasant distraction. This is best done directly from the source, the official website of the label, valentino.com. We'll be showing you the hottest looks from the Valentino fall 2013 collection as soon as the line is unveiled, so be sure to stay close!